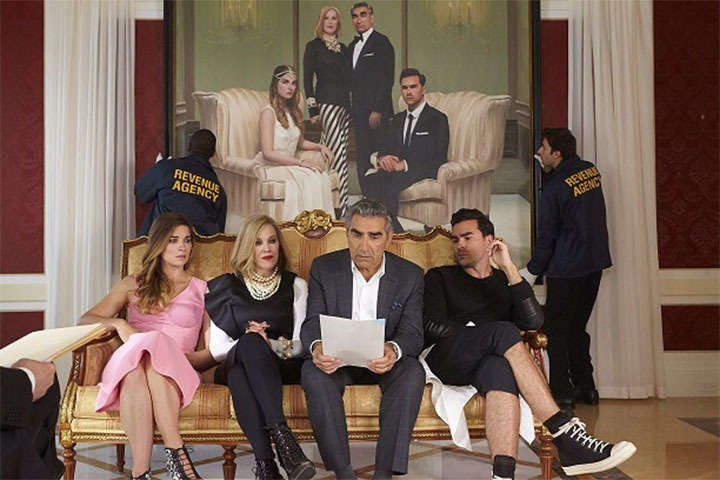 Note: Thanks to all who are still coming to this post as the amazing “Schitt’s Creek” continues its run (and hopefully will for a long, long time)! Please note that this post was published during the first season of the show and reflects only that season. 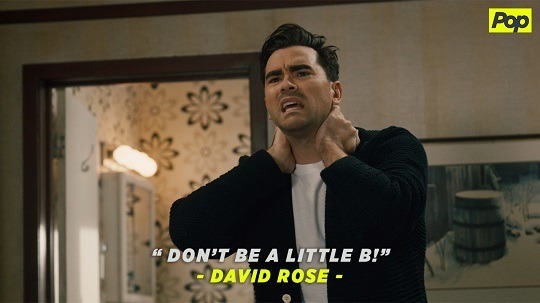 There are many reasons you should watch my new favorite comedy, Schitt’s Creek, currently airing on PopTV in the U.S. and on CBC in Canada. And one of those reasons is that they are quietly changing the game for queer representation in television comedy. Spoiler Warning: This post contains spoilers through season 1, episode 10 of the show. 1) Eugene Levy and Catherine O’Hara, together again! 2) A despicable family getting their comeuppance in the most hilarious fashion. The whole show centers on the Rose family, who have fallen into reduced circumstances due to a business manager who just “forgot” to pay their taxes. 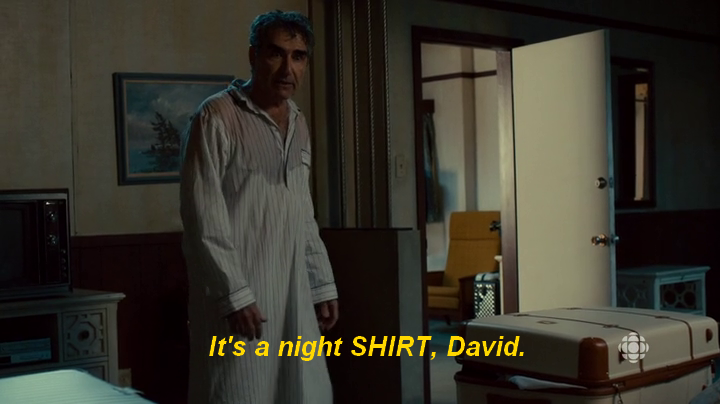 In the first episode, the family is forced to move to Schitt’s Creek, a small town Johnny (Eugene Levy) bought for his son David’s (Dan Levy) birthday as a joke. Turns out it’s the only asset of theirs that no one wants. There they find a whole host of small town characters who seem determined to make the family’s stay exceptionally painful. Johnny and Moira (Catherine O’Hara) struggle to make friends while their spoiled, grown-up children David and Alexis (Annie Murphy) try to find ways to escape. Comedy ensues, of course. 3) It’s gut-bustingly funny and quotable. 4) They quietly introduced a pansexual character and no one laughed at him. Well, not because of his sexuality, at least. 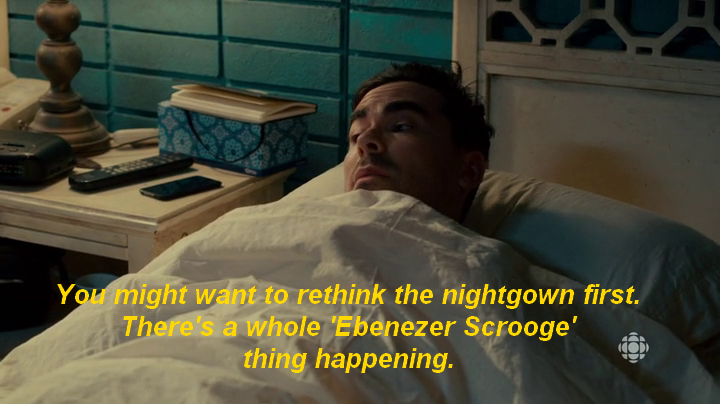 In season 1, episode 10, the “constantly baffled by the world’s indifference toward him” David Rose sleeps with his best friend and snark partner, Stevie. This confuses them both. Stevie, because she thought David was gay, and David because he didn’t realize he liked Stevie that way. Awkwardness ensues as they try to talk to each other about what has just happened. 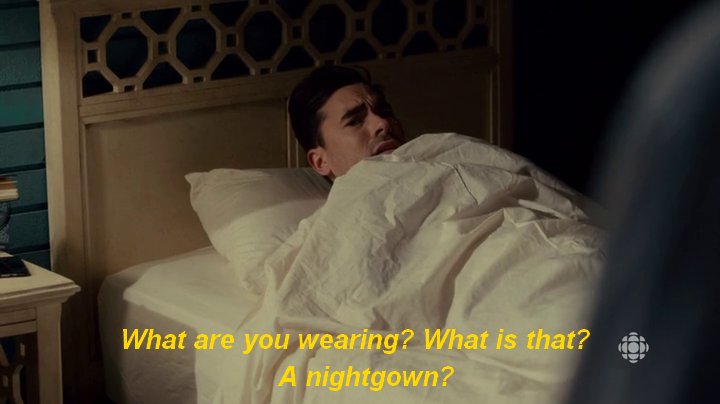 Stevie asks him pretty openly about it and they proceed to have an amazing and pretty simple conversation about David’s sexuality that also manages to make me want all the wines. Stevie: So, just to be clear… I’m a red wine drinker. Stevie: Okay, cool. I *only* drink red wine. And up until last night, I was under the impression that you, too, *only* drank red wine. But I guess I was wrong? David: I see where you’re going with this. Um, I *do* drink red wine. But I *also* drink white wine. And I’ve been known to sample the occasional rose. And a couple summers back I tried a merlot that used to be a chardonnay, which got a bit complicated. Stevie: Oh, so you’re just really open to *all* wines. David: I like the wine and not the label. Does that make sense? The comedy resides in the extreme awkwardness of not only sleeping with your best friend, but also the gossip mill that is a small town. Sexuality is accepted almost without a second thought. 5) And the “adults” are totally understanding. Johnny: My son is pansexual. Roland: Uh huh. I’ve heard of that. That’s, uh, that cookware fetish. Johnny: No. No, no. He loves everyone. Men, women, women who become men, men who become women. I’m his father and I always wanted his life to be easy. But just… pick one gender and maybe everything would have been less confusing? Roland: Well, you know, Johnny, when it comes to the heart, we can’t tell our kids who to love. Did you see that? Still no comedy at the expense of David’s sexuality. Where we might expect his father not to understand or Roland to make some backward comment and show his ignorance, neither does. Both men accept it, talk about how they want their kids to be happy, shrug, and move on. So there we go… an openly pansexual character on a comedy show handled in a gracious and enlightening way and the world didn’t end. Representation matters. 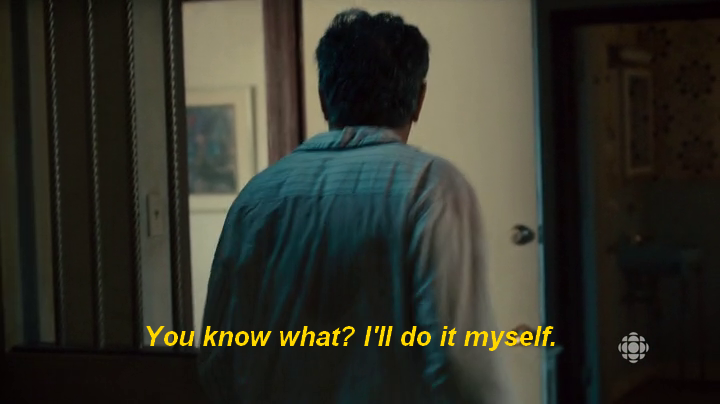 Well done, Schitt’s Creek. So tell me, do you watch? What do you think? And if you don’t watch, stop being a little b and go binge it! “Holidays With Jane: Spring Fever” Out Now! Still off on accurate descriptions of trans people (trans women were never men and trans men were never women). But yeah that’s a good step. Personally, I take no offense to such a perception. If someone is willing to accept me as female, I see this as a positive outcome. They’re simply reconciling the information that I’m providing now with that which I provided in the past (when I presented as male). In fact, I regard the perception that I’m a “man who became a women” (as opposed to a man in drag) as downright progressive. It isn’t psychologically accurate, but this is a complicated subject. It took me decades to come to grips with my own gender identity, so I can hardly expect others to understand instantly. © Kimberly Truesdale, 2011-2018. Unauthorized use and/or duplication of this material without express and written permission from this blog’s author and/or owner is strictly prohibited. Excerpts and links may be used, provided that full and clear credit is given to Kimberly Truesdale with appropriate and specific direction to the original content.